A U.S. Army helicopter crash-landed here Monday, due to a failure in the tail rotor, but the accident involved no major casualties, authorities said. 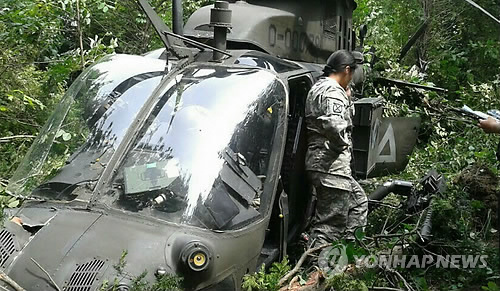 A helicopter for the 24th Division of the U.S. Army made an emergency landing on a hillside in Asan, South Chungcheong Province, at around 11:40 a.m. with the two pilots showing no outward sign of injury. When the rescue team arrived, the pilots, both of whom work for the U.S. Army, were waiting outside the aircraft for the rescue helicopter from U.S. Forces Korea to arrive, the officials said, adding the helicopter is also in generally good condition.